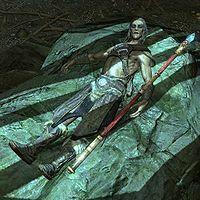 Gadnor is a dead Bosmer beggar lying on top of a rock inside Crystaldrift Cave. Lying beside him is Gadnor's Staff of Charming. A copy of the Restoration skill book Mystery of Talara, v 2 can be looted from his corpse. He wears randomly determined light armor. There is a 50% chance that it will be unlevelled fur shoes and a set of fur armor. If not, at levels 1-5, it can be hide boots and/or hide armor, at levels 6-18 it can be leather boots and/or leather armor, and at levels 19-28 it can be scaled boots and/or scaled armor or scaled horn armor. Additionally, he has a 50% chance of wearing a set of leveled gauntlets, again randomly determined; it can always be fur bracers, but at levels 1-5, there is a 50% chance it can be hide bracers, at levels 6-18 it can be leather bracers, and at levels 19 and onward, it can be scaled bracers. He carries a leveled bow as well. From levels 1-3 it will be either a long bow or a hunting bow, from levels 4-9, it will be an Imperial bow, from levels 10-14 it will be an orcish bow, from levels 15-19 it will be a dwarven bow, and from levels 20 and onward, it will be an elven bow. He also carries twenty leveled arrows which follow the leveling of the acompanying bow. Lastly, he has a 25% chance of carrying a lockpick and/or a bit of gold. According to the game data he was supposed to play a part in the quest The Mind of Madness and even had a schedule; he was supposed to sleep from midnight to 8am and then wander around Solitude asking the player for help. At some point during development, he was replaced with Dervenin and instead put in Crystaldrift Cave. This page was last modified on 8 February 2019, at 19:15.